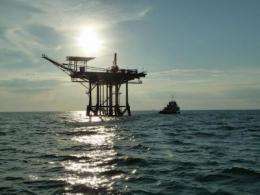 Since the explosion on the BP Deepwater Horizon drilling rig in the Gulf of Mexico on April 20, 2010, scientists have been working to understand the impact that this disaster has had on the environment. For months, crude oil gushed into the water at a rate of approximately 53,000 barrels per day before the well was capped on July 15, 2010. A new study confirms that oil from the Macondo well made it into the ocean's food chain through the tiniest of organisms, zooplankton. Tiny drifting animals in the ocean, zooplankton are useful to track oil-derived pollution. They serve as food for baby fish and shrimp and act as conduits for the movement of oil contamination and pollutants into the food chain. The study confirms that not only did oil affect the ecosystem in the Gulf during the blowout, but it was still entering the food web after the well was capped. Oil, which is a complex mixture of hydrocarbons and other chemicals, contains polycyclic aromatic hydrocarbons (PAHs), which can be used to fingerprint oil and determine its provenance. The researchers were able to identify the signature unique to the Deep Water Horizon well in the Gulf of Mexico. "Our research helped to determine a 'fingerprint' of the Deepwater Horizon spillsomething that other researchers interested the spill may be able to use," said Dr. Siddhartha Mitra of Eastern Carolina University. "Furthermore, our work demonstrated that zooplankton in the Northern Gulf of Mexico accumulated toxic compounds derived from the Macondo well." The team's research indicates that the fingerprint of the Deepwater Horizon oil spill could be found in some zooplankton in the Gulf of Mexico ecosystem at low levels, as much as a month after the leaking wellhead was capped. In addition, the extent of the contamination seemed to be patchy. Some zooplankton at certain locations far removed from the spill showed evidence of contamination, whereas zooplankton in other locations, sometimes near the spill, showed lower indications of exposure to the oil-derived pollutants. "Traces of oil in the zooplankton prove that they had contact with the oil and the likelihood that oil compounds may be working their way up the food chain," said Dr. Michael Roman of the University of Maryland Center for Environmental Science. The agu.org link is broken. Please fix! BP should be held responsible for all the aftereffects of this disaster.